In January I was approached by the generous team of Minerva Crafts who offered to try out one of their fabrics (including a pattern). I was over the moon and super excited, and rummaged through their shop for quite some time as I couldn’t decide (as always). The fabric arrived promptly in the mail two days later. Now, three months later, my dress is finished. What?! Three months? Shame on me! And why wait to finish a wool dress until it’s almost too warm outside to wear it? The reason it took me so long was that I struggled with the pattern. I picked a very ambitous Donna Karan for Vogue pattern, which was super hard to fit and in the end just didn’t work with the fabric I had picked. Lesson learned. I will show you the disastrous toile I made another time. I still love the pattern, but at the moment I’m still fed up with the fitting process and I will have to let some time pass before I can pick it up again. The main problem of the fit was that there basically are no side seams and A LOT of pleats which run diagonally across the back, side and front of the dress. Any alteration (eg. grading up to a larger size for the skirt) requires A LOT of thinking. Unfortunately, the lovely wool I picked was a bit too light-weight for this project. 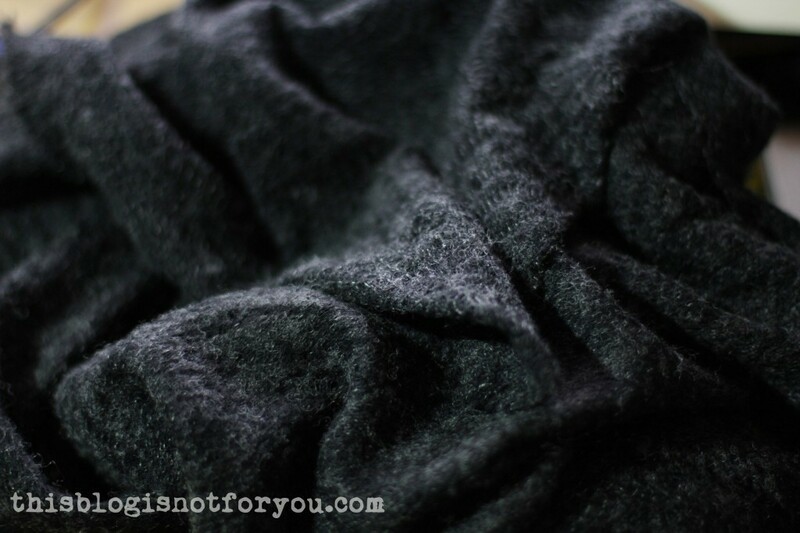 I picked three metres of a charcoal grey knitted stretch fabric which is 75% Acrylic, 8% Wool, 17% Nylon. 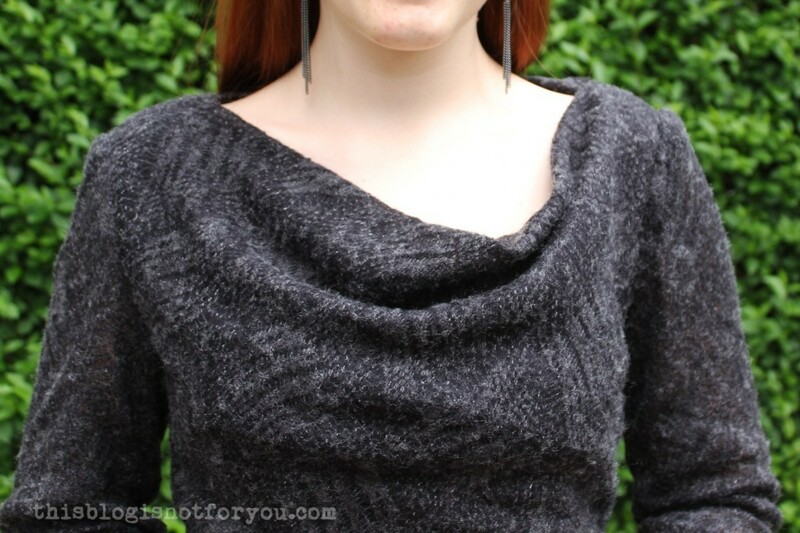 The texture is amazing and works really well with more drapey projects, such as the cowl neck dress I ended up making instead of the Donna Karan dress. I eventually went with a Burdastyle pattern of the 10/2012 issue, #118 A. 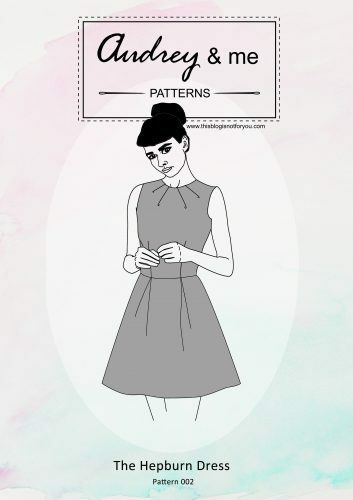 The pattern originally has a zip and is made for non-stretch fabrics, cut on the bias. I skipped the zip as my fabric was very stretchy, took the side in a bit and finished the project in one evening. That’s how fast is was! 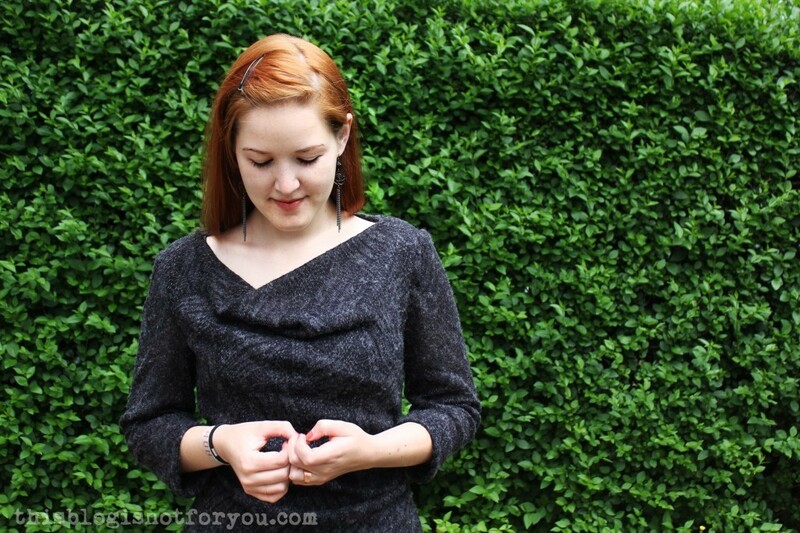 I love the cowl neck and the gathering at the waist and feel super comfy in this dress. I will probably not have too many occasions to wear it in the near future, as it’s a bit too warm for summer, but I see myself wearing this a lot in autumn and winter. It’s just so soft that I want to constantly hug myself (sounds a bit pathetic, I know). I have a bit of the fabric left which will be just enough for a little cardigan! 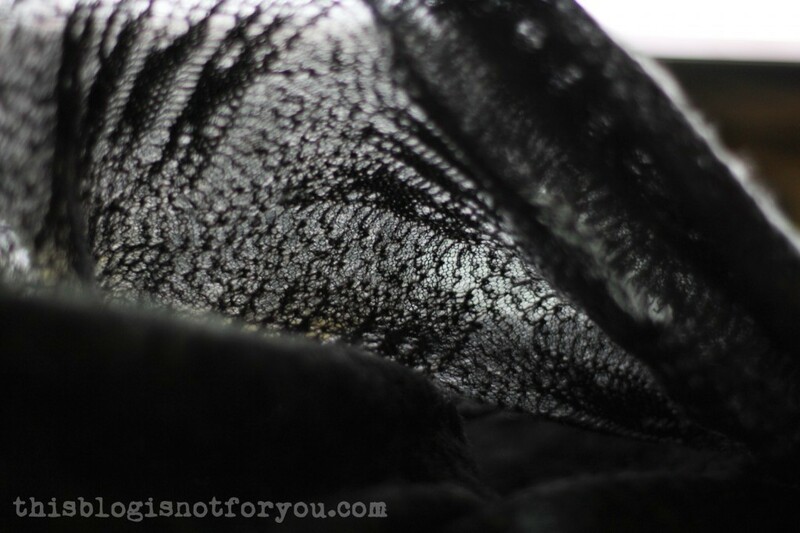 I’m also planning on sewing a little slip dress with some black spandex fabric, I’m a bit paranoid about the see-throughness of this fabric. And btw, this is #22 (actually it’s the almost unfinished #23) of my 27 Dresses Challenge! Five more to go! Will I ever be able to sew the Donna Karan dress? I’ll let you know, if I do. The countdown is on!!! I love this dress, for me it would be the most wearable. I like pullover dresses and neutral colors- you look amazing and that fabric really is to die for! Gorgeous! It doesn’t look see through in the pictures, but a slip’s a good idea if you feel paranoid. I’ve got a skirt which I think is see through (it’s not) and it doesn’t get worn – just in case. I love that dress on you Charlie! You look so elegant! 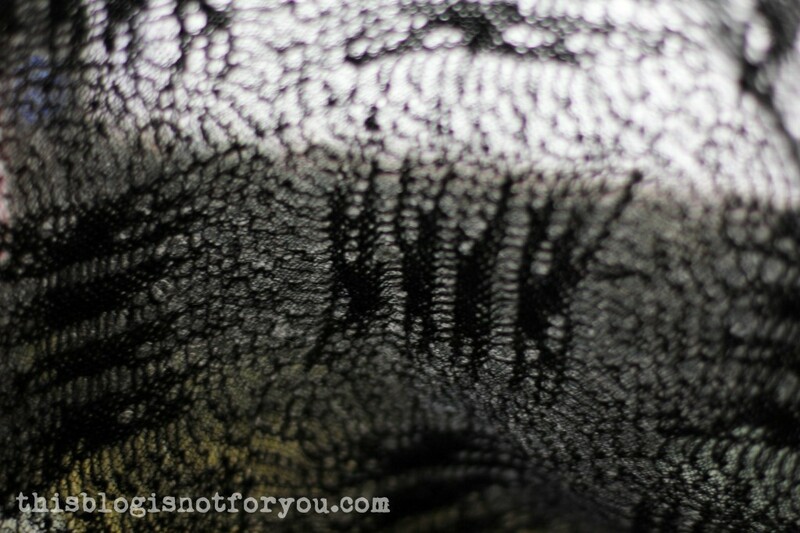 And I think it was a good decision to choose a better suited pattern for this fabric. 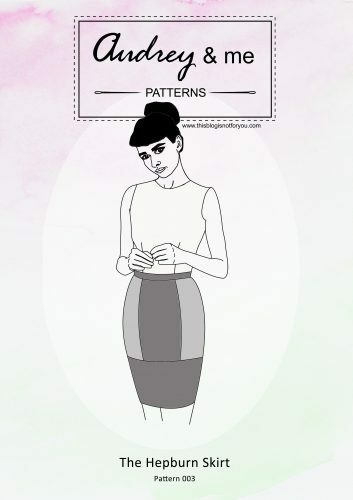 Your original pattern was sooooooooooo complicated! 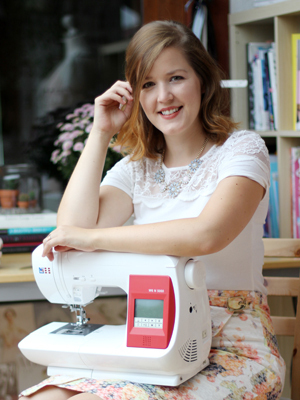 Just wanted to say thanks for doing such a fantastic project with the fabric we sent. Your dress is absolutely gorgeous and looks great on you! This is now another fabric on my to-do list…! Who cares for the Donna Karan dress when this one looks so amazing! No, I get your frustration and the Donna Karan pattern looks really cool as well. It can be so annoying when you have a plan set up and it doesn’t work out. However, this dress is great on you and you look stunning! This is lovely! Glad it worked out in the end, you’ve made something you could totally wear everyday or to smart occasion too! Good luck with the impossible to fit dress- looking forward to hearing more about it later. This dress is gorgeous on you! Such flattering lines. Aww, thank you! Love yours, too!